built for the era of AI. Hire with confidence with proven employee assessments. Imagine finding the right talent, faster, and guided by data. Opening up personalized pathways for your employees with AI-powered growth and development practices. Driving exponential business growth powered by talent empowered by technology. With Watson™ tools for HR, companies are seeing a 64% increase in candidates who progress to a face to face interview, a 20% increase in average monthly hires by recruiter, and a 47% increase in candidates submitted per day from recruiter to hiring manager. 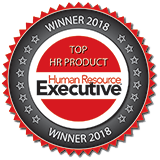 Watson Candidate Assistant has been named one of HR Executive’s Top HR Products of the year for its innovation, HR value-add, intuitiveness, and ability to deliver.